Routers are computers attached to the Internet. Like all computers, they end up with security flaws that miscreants exploit. Every device you have that is exposed to the Internet should be getting patched for security flaws. I do not hold much hope for light bulbs, but the NEST devices, Ring Doorbells, and Roku streaming devices seem to be updating their firmware. Firmware is essentially the basic programs that live even if your device loses power. Firmware is the programming that allows the device to be pretty smart as soon as electricity is fed to it. One of the new questions we should be asking when we look to purchase "smart" devices, is how often their manufacturer updates them and how long they continue to update them after the product has been superseded by the next greatest thing. Internet-connected printers are coming under the gun for their security flaws as more and more of them are being commandeered by botnets and used for nefarious purposes. However, one of the biggest problems is our router which we have to go through to access the Internet. If you are using an ISP's router, then just pray that the ISP takes care of it. However, if you own your own router, then you can take care of it yourself or ask your IT consultant to do it for you. Updates automatically in the middle of the night and lets you set that time. Or it could simply alert you through a text message. Has a 2nd ROM to hold the firmware and updates to the 2nd ROM. If something goes wrong it can switch back to the older one. Emails you an alert if it fails. - It could use an app to alert you. Backs up your settings first, so if you had turned off UPnP, or remote control, those wouldn't be turned back on after it mistakenly resets your configuration file. Forces you to check the modem manually for updates. Has some method of recovering from a failed firmware upgrade. If something goes wrong you can manually get back to your original firmware assuming you actually prepared for this possibility. Has a simple button to click on to update which it does for you. It also shows you what is being fixed and changed. It doesn't screw up your settings. Has no 2nd ROM, so a screwup could ruin your router entirely. Doesn't tell you what gets fixed. Sometimes resets your settings so you have to reconfigure your router unless you figured out how to back them up. As you might expect, the less expensive routers spend less on making sure you stay secure. I recommend the Asus routers which are in the middle category above. I'll use my Asus as an example. It doesn't alert me or automatically update. I need to access my router and check a few times a year. 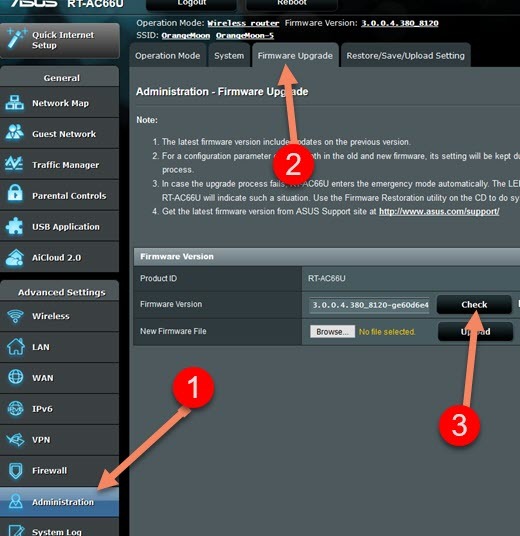 To access your router you need its IP address, username and password. I have a PDF setup form for routers as well as instructions that can be helpful. However, you need to be able to access your own router which means knowing where it is (IP address) and username, and password. This is not the WiFi password which allows people to access the Internet through your router. It is the password that allows you to set that password among other setup options. Once you've accessed your router there should be something right on the front page telling you whether you need to update the firmware. As you can see below, the arrow is pointing to nothing on my Asus router because I don't need a firmware update. However, there would be a flashing exclamation point if one was available. However, if you don't know that there will be a flashing symbol on the front page, you will probably find one for your router under a Firmware Upgrade tab under Administration. Every router is different, but this is typical. That should provide a version and also a check for a newer version. Better routers will make it easy to upgrade. Asus routers check and you'll click on an update tab and then it will upgrade for you in a few minutes along with a reboot of your router. I've never had any problem with years of updates. No lost configuration files or other disturbances. Do they use the dual ROM approach? I have no idea and can't seem to find out.